Interested in Learning to Fly Fish for Trout in Southeast Minnesota? Are you interested in fly fishing for trout but just haven’t made that first step into learning the basics yet? More importantly, are you interested in learning with one of your kids or a young mentor? This is an excellent program put on by the Minnesota DNR MinnAqua program and is a great opportunity for a hands-on learning experience. For details on how to apply, go to mndnr.gov/minnaqua. I’ve personally taken part in this event in the past as a guide to a father and his son and it was a well-organized, very worthwhile event. This entry was posted in fly fishing on January 15, 2013 by Randy. 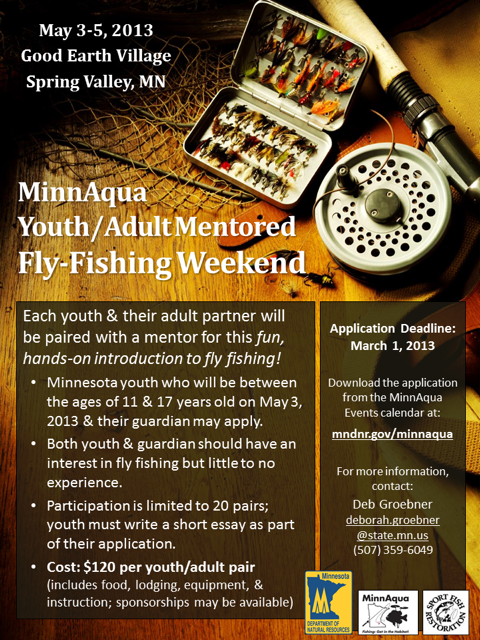 Just wanted to let you know that MinnAqua has extended the deadline to apply for the Youth/Adult Mentored Fly-Fishing Weekend until APRIL 1, 2013. Only seven applications have been received, and we have space (and mentors) for 20 youth/adult pairs! This awesome event features mentors from FFF, TU-Hiawatha, TU-Headwaters, Fly Fishing Women of Minnesota, the DNR, and other partners with additional support from the Izaak Walton League Bush Lake Chapter. Thanks for letting the new fly anglers in your world know about this unique opportunity to learn from the experts. Please encourage them to apply today! Contact me with questions: deborah.groebner@state.mn.us.